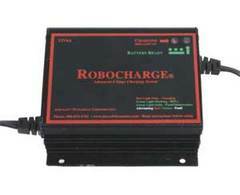 The 4346 Robocharge is a small, light weight advanced four stage charger - initialization, bulk charge, absorption mode and float/maintenance. Designed for charging XL Deluxe Pro Robopak, this unit is fully encapsulated, is vibration resistant, waterproof and is short circuit and reverse polarity fuse protected. Has four mounting holes for vertical or horizontal mounting. Bulk max current is 5.5 amps.